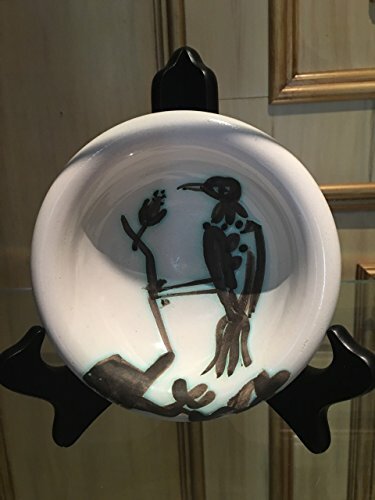 Bird on a Branch Picasso Madoura Ceramic by at When Art Imitates Life. Hurry! Limited time offer. Offer valid only while supplies last. Ramie 175 - Oiseau Sur La Branche 1952 Edition of 500 Turned white earthenware clay with white enamel and black glaze, oxidized paraffin decoration. Ramie 175 - Oiseau Sur La Branche 1952 Edition of 500 Turned white earthenware clay with white enamel and black glaze, oxidized paraffin decoration. Inscribed "EDITION PICASSO" on the underside Stamped "MADOURA" and "EDITION PICASSO" on the underside. Madoura Plein Feu pottery stamps on the reverse. Diameter 5 3/4 inches. Pristine condition. Although our dealership specializes in photorealism, we are also amongst the world's largest dealers of Picasso Madoura ceramics. Please check out our other listings for original oil paintings by the world's most renowned photorealists.